M-Audio has announced the immediate availability of its new Transit Pro USB to optical digital/DSD (Direct Stream Digital) converter. M-Audio developed the Transit Pro in response to a critical market need for a compact, super high-performance converter capable of taking an audio signal from a computer and delivering the highest quality digital signal to any audio component with an optical digital input. The key to Transit Pro’s outstanding audio performance is its 32bit/384kHz digital “engine,” which delivers a super-wide bandwidth frequency response, ultra-wide dynamic range and a totally inaudible noise floor. There are eight user-selectable sampling rates between 44.1 and 384kHz so users can achieve the exact performance level needed for any given circumstance. 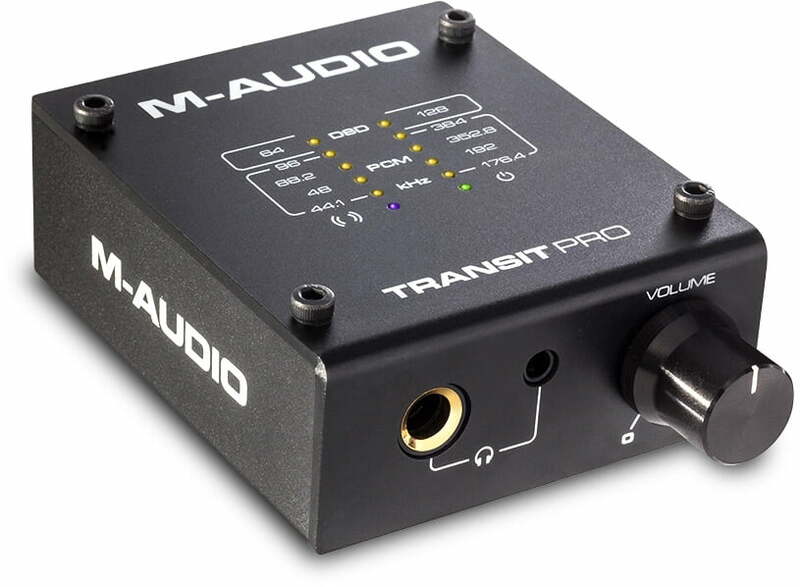 Transit Pro has a built-in high quality headphone amplifier with both ¼-inch and 1/8-inch jacks, for connecting any headphones directly without the need for an adapter. Transit Pro is USB-bus-powered or it can use an optional AC wall adapter (not included). Transit Pro is the answer when there’s need to deliver a reference-quality digital signal, going from a computer to an external audio component. Super-high resolution USB to optical/DSD converter. Eight user-selectable sampling rates: 44.1, 48, 88.2, 96, 176.4, 192, 352.8, 384kHz. Extremely low distortion: THD+N 0.003%. Direct Stream Digital rates: DSD64, DSD128. Dual headphone outputs: ¼-inch, 1/8-inch. Compatible with headphones from 16–600 ohms. USB-bus-powered or optional AC adapter. Transit Pro will ship with an MSRP of £169.99 GBP.